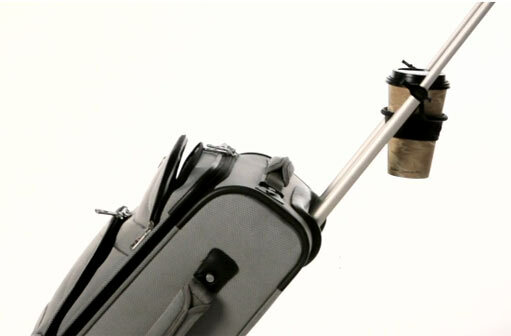 It can be difficult to make your way through an airport with a rolling suitcase, a bag and a cup of coffee. With the Tugo this task will be darn simple! This little rubber item straddles the pull poles of your rolling bag and provides a secure holder there for your coffee cup or travel water bottle. Out of the box the Tugo tends to be a little stiff; loosen it up and it will hold your drink perpendicular to the ground no matter how the angle of your rolling bag changes. And with the additional H2OTuGo, it can hold any bottle. TuGo costs $9.95 on TuGo website and if you want the bottle holder, then it costs additional $3. Amazon lists this product (only TuGo cup holder) at $15 at the time of publishing this article.